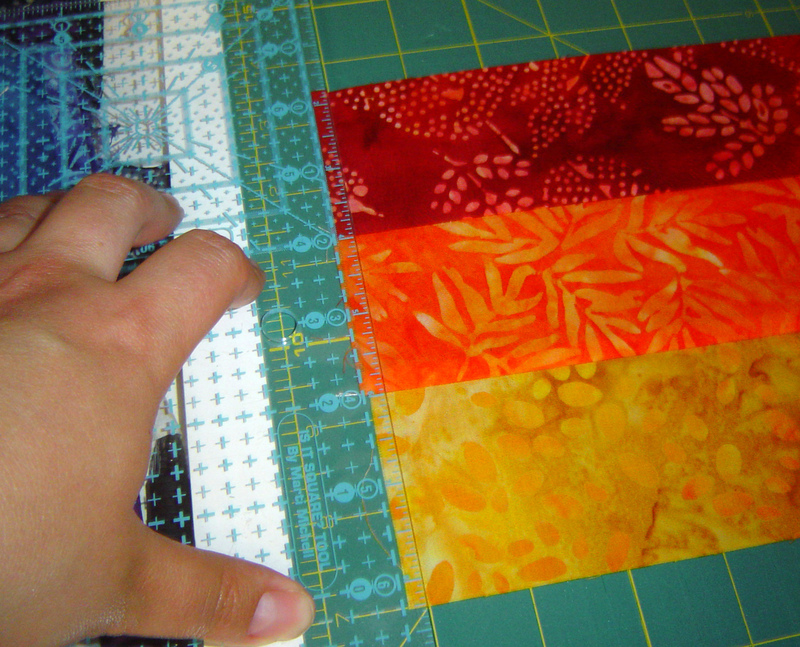 It’s not only hot(er) here, but I am working on a quilt block swap called hot flashes. The swap is so named because of the hot colors rather than the pattern. At least I don’t think the pattern is called hot flashes. 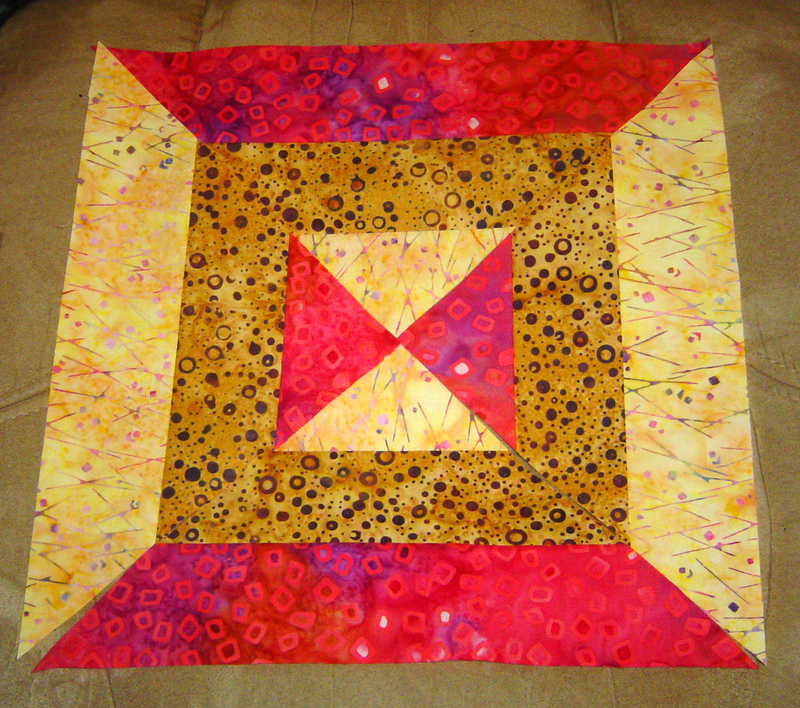 I’ll have to find a way to sash this quilt (once I get back the swapped blocks in May) so that my eyes don’t explode. But it’s an interesting block, yes? I found it challenging to do ‘light and dark’ brights, and some are successful with the light and dark and some are not. But these blocks are easy. 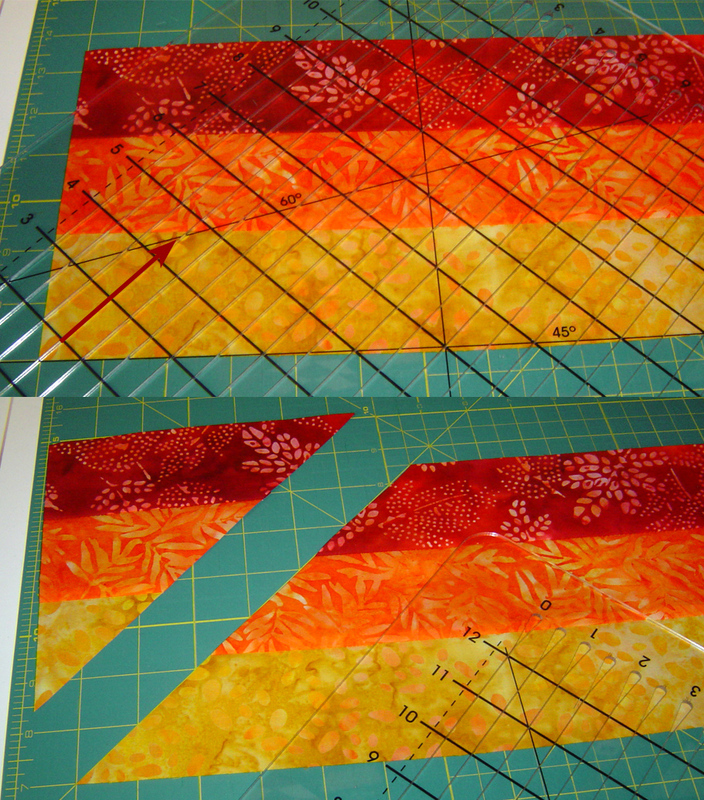 You take three strips for a whole block, you have to go width of fabric. At least you do when you start out with 2 1/2 inch strips (jelly roll sized). Then when you have all three strips sewn together, you square up one side straight. 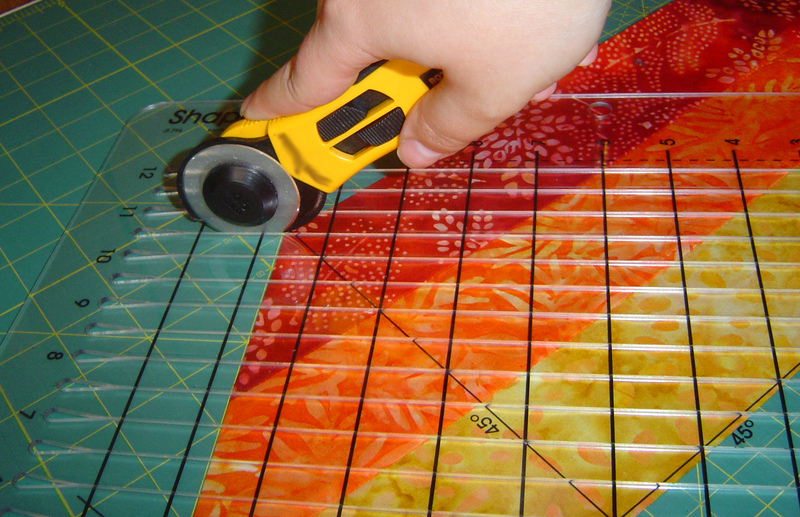 Then you take your ruler at 45 degrees and line up the 45 degree line with the bottom of the fabric (or you could line it up on the seam) and cut. You get a bonus half block here. I’m finding this ruler handy and it keeps me from wandering away. You cut each strip at a 45 degree angle. 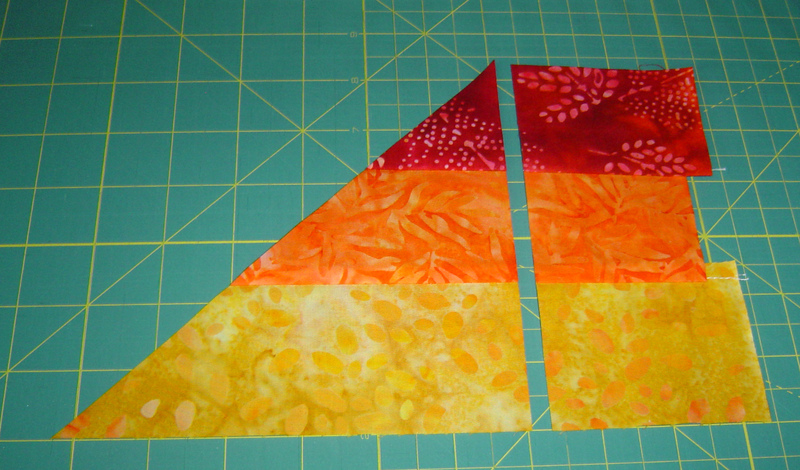 If you used fat quarters instead of the whole width of fabric, you get 4 bonus blocks for each set. I have a plan for the bonus triangles. Wouldn’t it look good set with solid, maybe black/subtle black and white? Neutral? For this swap, the hostess requests we use one fabric set for every block, instead of swapping out the different fabrics and making more of a scrappy block. Both would work, and there’s nothing that says that I need to keep my rotary cutter away from the finished blocks that I receive, is there? I just got word that my last swap (that’s still going on) may have too large of seam allowance (they’re a little small) and that my seams are not lined up well enough, and to help that, I need to pin. Sigh. I may get my own blocks back. And then I’ll have to resew them. Or sew new ones. Just when I think I can move away from the crutches (mental), I can’t. I was using a quarter inch foot specifically, so I thought I was lining up to that foot, and I wasn’t. And I was sewing squares, not triangles, and I still screwed up. Anyway, I’m not feeling too well, a little bit hot, also very tired. I think I may go lay down and call it a day. Sigh. Hey, so I’m not the only one who can sew incorrect seams even with a quarter inch guide! If it’s any consolation I just finished pin basting a bed size quilt and flipped it over only to find I’d pinned in ripples! Gotta start over! I too was thinking of calling it a day. Hope you aren’t getting sick. 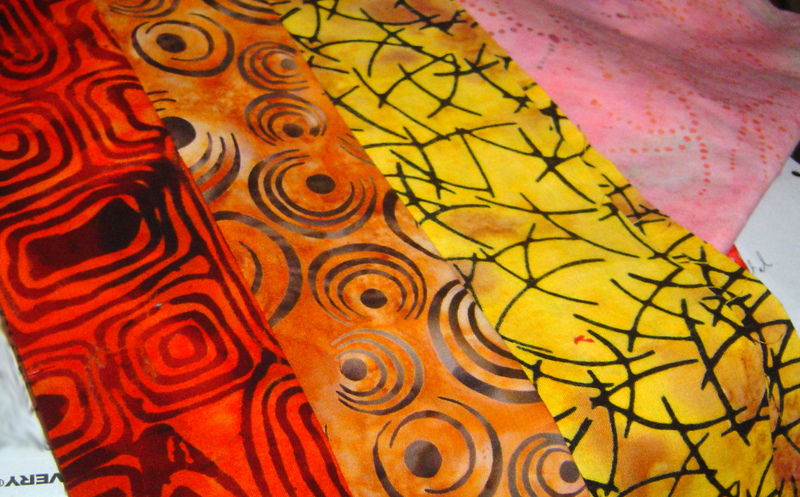 I find that black works well with hot colors for a sashing fabric. What a cool cutting method for this block! I really like it. Hope you’re feeling a bit better. We all have days like that. Is there another way to cut this block?